ACCENTS: Jet beads carved with the ancient Chinese Shou for long life and smooth rock quartz crystal ellipses. COMMENTS: Use this dragon as a reminder of how you need to energize your own health. 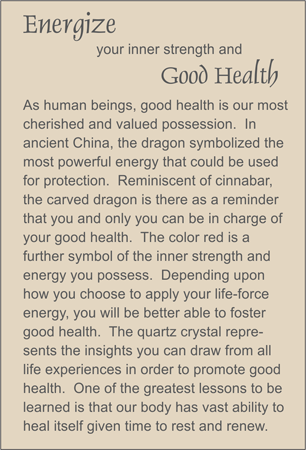 See different dragons in other styles of Good Health by scrolling down.